Did someone say coupons? Yes sirree! When I hear the word coupons, my ears perk up. When I hear about chances to win, they perk up even more. And when I top it all off with helpful items for the classroom, I’m as perky as a pup waiting for a treat. Let’s start at Lakeshore Learning. Click on this link to get 20% off any single nonsale item. If you haven’t checked out Lakeshore’s site, do so now. It has innovative educational materials that help kids through sixth grade achieve learning goals while still having fun. For more coupons, chances to win, and free resources, you need to click here. You could win a $500 or a $250 Office Depot OfficeMax gift card, you’ll get a free poster and free resources to help kids set goals, and there’s a different coupon for every month through April! Looking for a helpful way to light up learning? This multicolored light table has 16 colors, four modes, and brightness control. Use it to teach about colors and color mixing or for lighting effect during storytime or quiet time. Don’t forget—for a chance to win the book, you need to post a comment. PS: For more freebies and chances to win, click here! Love the office depot contest and the light table. The multicolored light table would be a great addition to my classroom. The book looks great as we love to read. The dog book would be a welcome addition to our library as well as the light table for our non-fiction area. Thanks for sharing. I would love to have the light up table in my classroom. We do a lot of center work and this would give my students another place to work at. I’d love to win a OfficeDepot Office Max gift card! I always find myself at the Lakeshore store so that coupon is great. Karen like most teachers I would love the office depot coupons and I can count on your blog to find the best deals. But the best part of your blogs are the books you highlight. This month looks like a fun read. Thanks, Carrie. We do love a good deal and a good book around here! I usually am just gazing longingly at Lakeshore Learning items, so I would love a coupon! R.G., it’s time to stop gazing and start shopping! Have fun! The light up desks are really cool. Those would be so fun in the classroom. Any of these would be great additions to my busy classroom! The gorgeous table gets my vote. My current tables have been overused. That table is awesome! I have shopped at Lakeshore.Their products are durable and useful. That light up table is amazing for a classroom of children with sensory needs like mine! 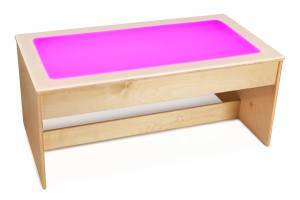 The light table would be perfect for our art & sensory themes! 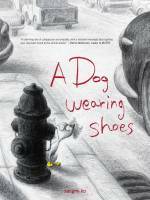 Absolutely intriguing cover to the Dog Wearing Shoes. My library kids would love it! The Dog Wearing Shoes looks adorable. The multi-colored light table would be an amazing addition to our library. I would use it to make storytelling a little more exciting and allow students to use it at an activity station when they finish their assignments. Wow! I am going to have to talk to my principal about that awesome light table! I would so much love the A Dog Wearing Shoes book! Thanks!